A differentiating factor in cutting edge industries is the time it takes to transform an idea into a viable, effective product. The company that develops the product first gets the proverbial worm. This ensures not only possible revenue from sales but also the potential of government grants or contracts. It pays to be ahead of the pack. In order to create an environment that fosters expedient and ingenious production, a company must provide the most versatile and advanced tools for product development. 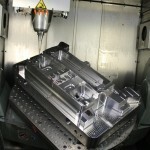 One such tool is the 5-axis CNC machine. This machine is capable of transforming previously unwieldy materials such as steel, alloys, rock, and almost any other practical material that can be used for industrial applications. Essentially, this shifts a company’s attention away from technological capacity to programming creativity. Programming the CNC machine is the only process that separates an engineer’s design from a new product. One of the most common materials used in the fabrication of many consumer products is plastic. It comes in all shapes, sizes, and varieties. Machining various types of plastic can be a delicate task; however, with the efficient efforts of a CNC machine it can be done precisely time after time. Some growing areas of plastic application are automotive fixtures, construction components, and general metal to plastic conversions. Plastic is less expensive than most other materials and can have a variety of different properties, which makes it an ideal medium for taking advantage of CNC machining. The rigorous safety standards and cutting edge design of today’s aircrafts demand no less than the most advanced parts manufacturing system. With CNC machining, the advanced geometry of aircraft components, such as honeycomb-patterned metal, can be achieved. This means more efficient design, higher performance, and happier end-users. Companies that can obtain this technology will be at a significant advantage from a product spec point of view. The versatility of this application may contribute to the growing interest in developing aircraft capable of travel beyond our own atmosphere. This concept may become more practical and pay testament to CNC machining’s unrivaled potential. The healthcare industry is a beneficiary of this technology because it allows biomedical engineers the ability to produce seamless and intricate pieces to be used in prosthetic and interventional procedures. For instance, hip or knee replacements that must be formed from a noncorrosive metal can be custom milled with extraordinary precision for optimal performance in human application.